History: (Skrulls! (fb) - BTS) - The Carnival was a slave ring that posed as a carnival, setting up on various worlds and luring in its prey using entertainment. (New Mutants I#92 (fb) - BTS) - After having obtained slaves from other alien races such as the D'Bari, the Carnival set up on Earth in rural Kentucky. (New Mutants I#92 (fb)) - Following the events of the demonic Inferno, the New Mutants visited Cannonball's family in Kentucky, where they were taken to the Carnival on a free night by Cannonball's mother Lucinda. 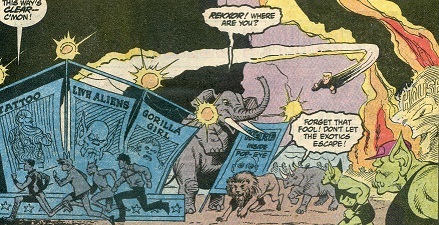 Almost immediately upon their arrival, the New Mutants were surrounded by animals led by animal tamer Sebastian, who promised Boom-Boom that she had nothing to fear from his animals. While the other New Mutants quickly began enjoying themselves, Wolfsbane remained suspicious, unaware that Sebastian had learned the "animals" of the New Mutants' true identities as superhumans. As a "clown" (actually the Skrull Horio) spoke with Sebastian about testing and then culling the New Mutants, the heroic teens continued on their way through the Carnival until Wolfsbane was attracted by a teddy bear that seemed to be exuding a smell that lured Wolfsbane into a carnival game. Affected by the bear, Wolfsbane announced that she couldn't live without the teddy bear, prompting Sunspot to make an attempt at winning the bear by knocking down milk bottles with a ball. When the ball consistently fell short, Sunspot used his powers and still failed to even throw the ball far enough to hit the bottles. An annoyed Sunspot gave up, suspecting the game of being rigged, but Boom-Boom was determined to knock down a bottle. Hurling the ball with a small time-bomb behind it, Boom-Boom succeeded in knocking down the entire stack of bottles and winning the bear for Wolfsbane. As the New Mutants left the game, the clown visited the game barker, who admitted that the New Mutants could be dangerous and showed the clown what Boom-Boom had done to their Analysis Ball. The clown remarked that the New Mutants had merely sealed their own fate and doubled their value. Soon after, Wolfsbane became extremely weak and dizzy, forcing the New Mutants to visit the Carnival's first aid station. The "nurse" at the station told the New Mutants that Wolfsbane needed her rest, suggesting they leave her behind to enjoy the Carnival but the New Mutants decided to take shifts staying with Wolfsbane, who was given medicine by the nurse that quickly knocked Wolfsbane unconscious. Rictor turned to confront the nurse but was knocked out himself by the clown, who sprayed Rictor with gas. When Rictor and Wolfsbane came to inside the Carnival's "Active Homunculi" exhibit, they saw the clown, who revealed the Carnival as a group of Skrull slavers and announced that the heroes were now the slavers' property alongside other captive humans. Unaware of their teammates' situation, the other New Mutants visited the Carnival's fun house, where they were shown captive aliens, which they thought were robots or illusions until Cannonball noticed the "Alive Homunculi" exhibit. Noticing that the figures in the exhibit seemed scared, Cannonball was about to leave when Rictor created vibrations from within the exhibit, drawing Cannonball's attention. One of the aliens that Boom-Boom had earlier thought was a robot then returned and attempted to grab Boom-Boom a second time, revealing that he wasn't a robot when Boom-Boom tried to remove his "mask." Fighting back, Boom-Boom destroyed the Active Homunculi exhibit, freeing the shrunken slaves and reuniting the shrunken Wolfsbane and Rictor with their teammates. The other shrunken captives then erupted from the fun house, surprising many of the Carnival patrons and forcing the Carnival to shut down. 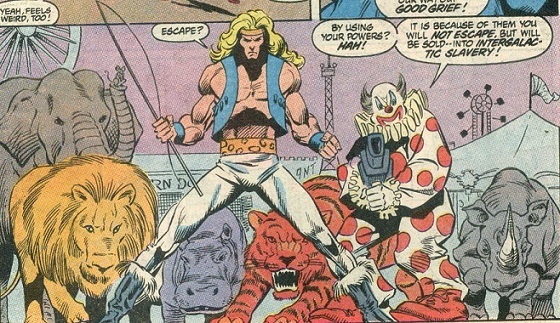 Escaping, the New Mutants, along with Rictor and Wolfsbane, who began returning to normal size, were confronted by Sebastian, Horio the clown and Carnival animals. Announcing the Carnival's intention to test, cull and collect new slaves for the Skrulls, Horio also admitted that they could no longer return to the true Skrull forms before covering the New Mutants in a net that sapped their energy. Sunspot managed to destroy the net and fight back, punching both Sebastian and the clown as more Carnival Skrulls arrived. The ensuing fight began destroying the Carnival and when the police arrived, another Skrull, Gragnon, asked what they should do and Horio ordered the Carnival to retreat to travel somewhere they could capture quarry without a fight. Despite another Skrull informed Gragnon that her brother Rekxor had went missing during the scuffle, the booths and buildings of the Carnival quickly merged and transformed into a spaceship, which rocketed away, leaving Rekxor behind. (New Mutants I#92) - Wolfsbane told the New Mutants' then-leader Cable about their encounter with the Carnival, unaware Rekxor, still in the form of a mouse, was watching them. Comments: Created by Dwight Zimmerman, Bob Hall and Jeff Albrecht. Another member of the Carnival that was not fully identified was "The Man with 2..." but the rest of his Carnival marquee was blocked from view. "Clyde" was only identified by the nickname he was called by Boom-Boom. Similarly, the Skrull posing as the animal tamer was only referred to by his stage of name of Sebastian. Both of these Skrulls' true names remain unrevealed. While only mentioned as a "disaster," the reason that the Carnival Skrulls were trapped in their Carnival forms was presumably the detonation of the Hyperwave Bomb. The Analysis Ball was a Skrull device that tested the abilities of those throwing it. Judging its user's strength, the Analysis Ball would stop at a certain point when thrown, only going further if more strength was used. Hidden inside a baseball, the Analysis Ball was used at one of the Carnival's game, where it was to be thrown at a set of milk bottles. While trying to win a stuffed teddy bear for Wolfsbane, Sunspot hurled the Ball, only to have it stop short of the bottles each of the three times, even when Sunspot used his powers on the third throw. Determined to win Wolfsbane the bear, Boom-Boom then tried the game, hurling both the Analysis Ball and one of her time-bombs simultaneously. The time-bomb boosted the Analysis Ball, causing it to actually hit one of the milk bottles just as the time-bomb exploded, knocking all of the milk bottles over. Once the New Mutants had left, the Skrull posing as the game barker warned Carnival leader Horio that the New Mutants could prove dangerous, pointing out that Boom-Boom had destroyed the Analysis Ball. "Clyde" was a member of the Carnival who attempted to grab Boom-Boom when the New Mutants were enjoying the Carnival's fun house. When he first failed to grab her, Boom-Boom merely thought "Clyde" was a fun house robot, but when he tried again and succeeded in grabbing Boom-Boom, she attempted to remove what she thought was a mask, only to learn that it was "Clyde"'s true face. Instinctively fighting back, Boom-Boom unleashed a time-bomb that knocked "Clyde" out and shattered the fun house's Active Homunculi exhibit, freeing its shrunken captives. 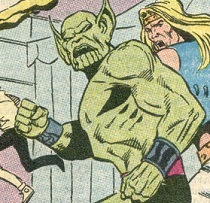 Gragnon was one of the many Skrulls working for the Carnival. During the Carnival's battle against the New Mutants, Gragnon reported the police's arrival and Sebastian asked Gragnon what they should do. Horio was the leader of the Carnival's Skrulls and was stuck in the form of a clown. When the New Mutants arrived at the Carnival, Horio was informed of their superhuman nature by Sebastian. Following the New Mutants as their powers were tested, Horio next met with a Skrull posing a game barker, whose Analysis Ball was destroyed by Boom-Boom's powers. Feeling as if the New Mutants' value had doubled, Horio continued following the New Mutants until Wolfsbane was rendered unconscious by a Skrull posing as the first aid nurse. Before Rictor could fight back, Horio hit him with a dose of gas, knocking him out as well. Horio then revealed his nature as a Skrull slaver to Wolfsbane and Rictor before departing. 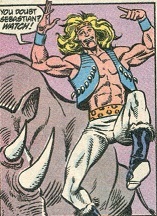 When the other New Mutants managed to free Rictor, Wolfsbane and numerous other shrunken Carnival captives, Horio led the rest of the Carnival in attacking the New Mutants, hitting the group with a net that sapped their energy. Sunspot managed to free his teammates, punching Horio and Sebastian in the process. When the police arrived, Horio ordered the Carnival to retreat elsewhere, where they could capture quarry without a fight. Mabel was a Carnival patron who had no idea of the Carnival's true nature as Skrull slavers. When the New Mutants freed the Carnival's shrunken captives and the tiny-sized humans ran for safety, the swarm of tiny humans surprised Mabel, whose husband warned her to look out. Rekxor was a Skrull Carnival member trapped in the form of a white mouse and brother to a female Skrull trapped in the form of an elephant. During the Carnival's battle against the New Mutants, Rekxor was hurled into the air and lost in the scuffle. Despite not having Rekxor with them, the Carnival ultimately retreated, transforming the Carnival itself into a spaceship and left, leaving Rekxor behind. Some time later, Rekxor, still on Earth, witnessed Wolfsbane telling New Mutants leader Cable of the New Mutants' encounter with the Carnival. Trapped in the form of an animal tamer, the Skrull posing as Sebastian tricked the New Mutants upon their arrival at the Carnival by pretending to be friendly, only to report their superhuman nature to Carnival leader Horio when the New Mutants left to enjoy the Carnival. Later, when the New Mutants freed some of the Carnival's shrunken captives, Sebastian and Horio, as well as the Skrulls posing as Sebastian's animals, confronted the New Mutants and Sebastian was knocked aside by Sunspot. As the fight continued, the police arrived and Sebastian questioned his Skrull ally Gragnon what they should do, prompting Horio to order the Carnival to retreat.